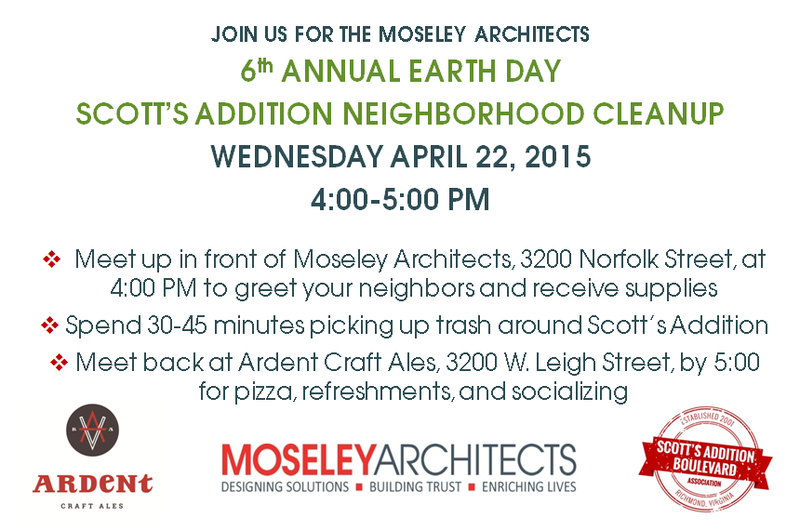 Moseley Architects Richmond headquarters is planning its 6th annual neighborhood trash cleanup for Earth Day, April 22nd, 2015. This event has grown every year, from just a few Moseley volunteers in 2010 to hopefully the entire Scott’s Addition neighborhood. We’re inviting anyone and everyone who would like to help beautify Scott’s Addition to meet up here at Moseley on the front lawn at 4:00 to receive bags, gloves, and a limited number of long-handled grabbers. Afterwards we will head to Ardent Craft Ales for pizza provided by Moseley Architects and snacks provided by Relay Foods. And you can of course grab a cold beverage at Ardent! This entry was posted in Uncategorized by eab8h. Bookmark the permalink.